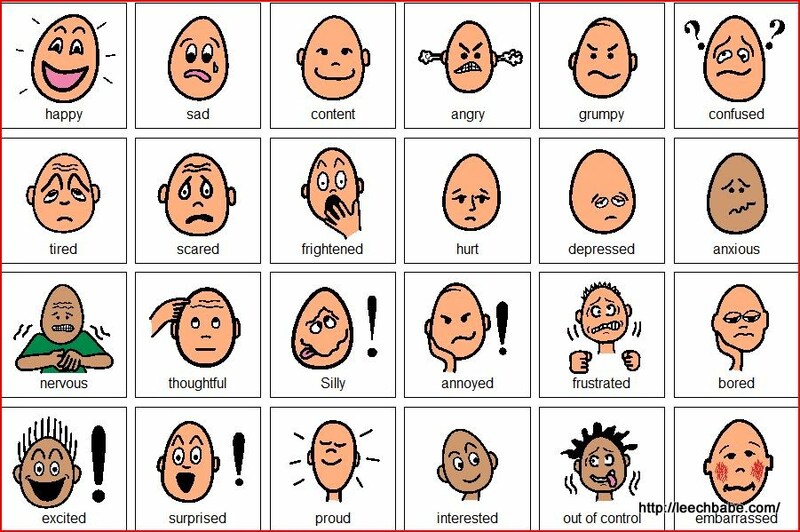 If you’ve been around these parts for a while, you know that we’ve been working with Brooke on identifying emotions for YEARS. Despite fleeting glimmers of hope along the way, Brooke, like so many kids on the spectrum, has had a very hard time identifying feelings – both her own and those of the people around her. We’ve spent years tagging emotions in conversation, “Honey, that looks a little tough. I can see that you are frustrated.” and “When I see someone who has been away for a while, I feel excited!” or “What a wonderful gift from Grammy, I’ll be that makes you feel happy!” The successes came, the words were repeated, but never seemed to really stick nor have a whole lot of depth beyond the most basic associations. Recently, the full court press to teach Brooke emotional identification has taken on a fever pitch. Exercises are woven throughout every part of her day. With her aide, she writes a note home to one of us every day telling us one thing that she did that day and then circling the egghead portraying the emotion of her choice to tell us HOW IT MADE HER FEEL. She reads stories with her speech therapist and fills out worksheets about how the events in the stories MADE THE CHARACTERS FEEL. With another, she colors in single scenes from a coloring book and talks about the action within and HOW IT MAKES THE PEOPLE IN THE PICTURES FEEL. Emotional identification has become constant in her world. Not quite the WAY in which we’d hope to hear it delivered perhaps, but nonetheless a huge step forward from an ear-piercing shriek. I grabbed a tissue box and handed it back to Katie who tried to tell me she didn’t need it. Apparently it’s the law that at nine and three-quarters, when you’re sniffling and your mom hands you a tissue, you have to say “No, thanks.” I insisted. She took it, made a half-hearted attempt to blow her nose, then resumed snorting. Ew. I began to celebrate. “Brooke, that’s awesome that you could tell .. ” She interrupted before I could continue. The word hung in the air as she searched for whatever it was that she planned to add. My girl is getting this, I thought. She’s REALLY getting it. The idea that emotions can be rich and textured and layered and three-dimensional. That one word is almost NEVER enough to describe how we FEEL. That so often we need to circle two, three, four little eggheads to really describe where we are at any given moment. That emotions – even conflicting emotions – aren’t mutually exclusive, but often co-exist on the tumultuous seas within our hearts. Ok, perhaps I got a little carried away with that last part, but she had said ‘and’. Something else was coming. I wondered what she was going to add. The anticipation was killing me. I thought through some of the emotions she’s been working on. Anxious? Nervous? Had they taught her ‘Uncomfortable’? With tremendous conviction, she gave us the final word on how she was feeling. Hey, guys? I think she’s getting it. I love it!! So well done and terrific, hard-earned progress. Congratulations to all. And, YES, she is most definitely getting it! That is great! I pray for the day when I can even figure out what is making Jimmy randomly scream. I do the same stuff with emotions though. We watch those Pixar short films and I help him identify the emotions of the different characters. Aidan routinely tells us that his drink (with vitamins) is “bisgusting”, and I correct the pronunciation, but I really don’t want to! WTG Brooke!!!!!! That made me feel HAPPY!! Love to hear successes like that!! Brooke is really getting it in the best way!! Woo Hoo!! i have a very difficult time identifying emotions…and the main problem is that they’ll happen, i’ll feel them, but i can’t correctly identify where they came from. i’ll experience free floating, seemingly random reactions, i have trouble connecting them to their origin. and it was only when i recieved a diagnosis, in my 30’s, that i knew the nature of the problem. the doctor explained, “this is common with your diagnosis”. and she broke out the chart with little faces and said, you need to use this. and i said, “no way i’m doing that, it’s kids stuff”. and she said, “it’s asperger stuff…may feel embarassing, being an adult, using this, but it’s step 1”. and it was awful, that was one emotion i was definitely able to identify, embarrassment…but the difference it made was enormous. i still can’t immediately identify emotions, it can take days, weeks, but now i know TO identify them…i know that it’s necessary. and it’s been extremely helpful. so i read your post and it’s just very, very exciting that she is already working so hard on that. she is getting more and more tools in her tool box and pretty soon she is going to tackle this world with all of her wonderfulness and uniqueness. Oh yes. She so has it. And when my 9 year old sniffs up that gunk I also feel annoyed and disgusted! Also, I completely agree with her. Snorting and sniffling is enough to make me insane. I have my own sensory issues. Cats don’t have dogs and all. 🙂 Honestly, Brooke handled it with more civility that I usually do. Her sister disgusts her! That’s so awesome! Truly. This one really made me laugh, GOOD FOR HER (and I totally agree!). If this made me laugh so hard I snorted my coffee, is that disgusting-squared? Yay Brooke! That is EXACACTLY how it makes me feel when my 9 year old keeps siffing. Annoyed and Disgusted!!! just spit out my lunch laughing. and way to go Brooke! Oh yeah! She’s getting it! So awesome. I love your blog. I came across it by accident and am hooked. You seem to be able to explain all the things that I can’t right now. I’ve even added you to a list of blogs on my blog which is not nearly as good as yours. Ah… when sibling fights are a GOOD thing! Did Katie respond back? I Love it! She’s disgusted! Way to go, Brooke. Emotions are tricky. They’re very personal and what YOU feel when you see someone whom you haven”t seen for awhile, for example, might not be what your DD feels. Maybe she’s not excited. Maybe she’s apprehensive. Or confused. or shy. People “on the spectrum” have very deep feelings but their feelings might be for a song or a favorite object or a type of weather. Other people, while necessary, are too confusing and changeable to associate any one emotion with them. Yay for Brooke — and YOU, because what you are doing is working! One thing that helped my Aspie daughter a lot was playing the “acting” game — we’d all take turns acting out an emotion and the others would have to guess what it was (sort of like charades); and we’d play a game where we’d name an emotion and Caroline would act out what feeling that emotion would look like. It was something Caroline loved and I think it helped her figure out a lot.